Thanks, it perfectly works in my Dell XPS 14!! perfect! Worked for me as well. thanks! Thanks Mate Worked For Me. Thanks, it perfectly works in my Dell XPS 15!! If two-finger-tap right click still doesn't work, repeat steps 1-2 and then find the MultiFingerTapFlags entry and change the value to "3"
Thank you very much Max. This fixed it for me. I follow your instruction but My Lenovo S400 didn't work. Please help! Hero! Doing this worked for me. Also like others I had to use the TouchPadSMB2c folder. Doesn't work on my Dell Inspiron 3521. I downloaded the latest drivers too. Always had an issue with this two finger tap. Some of you guys have XPS' which should use similar drivers but it ain't working for me. Navigate to the same path as in step 2, except for the last part. Our model has a "TouchPadSMB2c" folder next to the "TochPadPS2" folder. 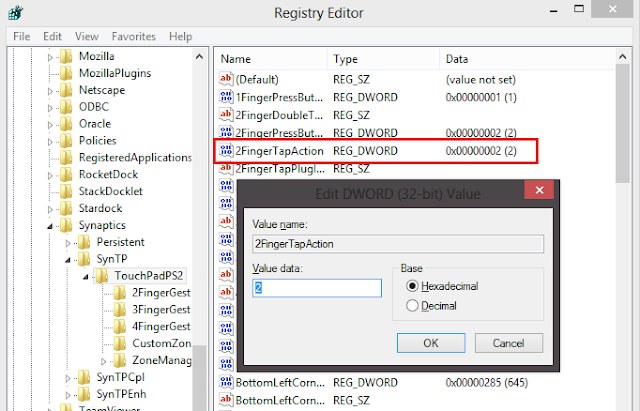 The registry entries are the same in both folders, but I think only the "TouchPadSMB2c" folder has any effect on this model's touchpad. So, change the same values as in the article in this folder, but also set "MultiFingerTapFlags" to 3, as someone pointed out above. It worked for me on my Inspiron 5437, set the values in the folder TouchPadSMB2c. Thanks OLI! I was wondering why mine still didn't work after reboot. It worked perfectly. So so so happy! I've been messaging Lenovo and Microsoft about this ever since the 8.1 update came out. Oh! And is it normal that I can't edge swipe anymore? I tried restoring edge swipe from my mouse settings but the double tap didn't work anymore so I did the hack again and no more edge swipe...is there anyway to do double tap while still having edge swipe? Sorry, I have no idea, I've never used edge swipe. I have TouchPadPS2 in my registry, but there is no 2FingerTapAction. I have 2FingerGestures, 3FingerGestures,4FingerGestures, CustomZones, and ZoneManager. (Zone manager looks like it has potential to resolve another problem I have, too much sensitivity). Would you suggest I follow your instructions as if I didn't have SynTP and add the code in my existing TouchPadPS2 file? I am loath to mess with Regedit on my own. yes it works but my device is SMB2c ... thx! anyway its stupid solution. Why missing this option in Synaptics driver?! This is great! Thank you. It's a shame the Synaptics driver doesn't work properly on its own.. Such a simple fix. Issue fixed on Lenovo Y500 with Win 8.1 Update. Need to change it in "TouchPadSMB2c" as said above.. Thanks a lot guys !! Just one more observation since my last comment: If you enable/disable any of the gestures in the Synaptics settings, you have to apply this hack again. Yay! This works perfectly on my Lenovo S415 Touch using the "TouchPadSMB2c" method. Before it used to work well but now don't know what happened it don't work. I did all the steps that you had mentioned above but thats still not working.!!!!!!!!! Hye, it works! but i have one small problem here, why my double tap gesture for scroll down/up not working anymore. However, the double tap gesture for zoom in/out work perfectly. Same goes to double tap gesture for forward and back. Can you please check whats wrong with it. and can you list the number in the box and the fuction of it. Thanks for your hardwork! Keep it up! very appreciate it. ADVICE: If the didn't work for you after restarting your PC, check if you have the TouchpadPsmbc2 folder in addition to the TouchpadPs2 folder. If you do, apply the ix to both folders, and restart your PC. It's a shame that the synaptics settings console isn't good enough to change this simple setting.Some help for those the fix didnt work for. Yes, finally this worked in my lenovo Z500, but needed to change it in "TouchPadSMB2c". Thank you guys. what to do if there is no such synaptics folder under software? It happens in my lenovo z510 59-398016. There is no Folder named synaptics that means you have not installed synaptic touchpad drivers. Install drivers and then try again. Thanks. Your solution worked. I only had to add an entry under TouchPadSMB2c. Hi, mine is DELL XPS L502x, win 7. i dont have the MultiFingerTapFlags in my registery but I do have the 2FingerTapaction. It boggles my mind that such a simple task is so un-intuitive to execute. Thanks for shining a light on this! If i wanted to not use the 2 finger touch would I set the value to 0? This is not working in my Flex 2 14. I have modified values for both registry keys, but still am unable to double tap for right click. Hello how to fix this issue for ELEN Touchpad ? Thanks for info. mechanical buttons on touchpad are just stupid and annoying. Is there some simillar way to add a 'middle click' with the three fingers tap? This solution still works to restore two-finger tap right click function on Windows 10 on Lenovo Yoga 3 Pro that somehow stopped working after an update. Thanks for the info! It was a pain to click with 2 fingers for right-click menues all the time while other people just uses their touchpads with enabled 2 finger tapping. I cannot understand that LENOVO does not offer such a feature in some of their T series! 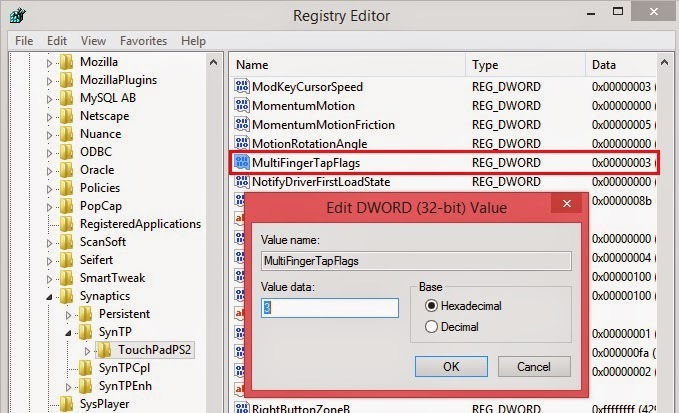 Couldn't find the MultiFingerTapFlags but even without it, this worked on HP Probook 6460b on Windows 7 Enterprise edition. Please could you provide the same for Elan Touchpad .I've been searching everywhere but got nowhere. How can to fix it? OMG perfectly work! Thanks so much bro! Restarted and 2 fingers tap back to work. It's not working for Lenovo g50-80, windows 10. For elan drivers the process is same, just set both, 2 finger tap and 2 finger enable, to 1. Works on my lenovo y50 70. Thank you! This fix works on HP laptop with the official HP drivers. I only needed to create the dword MultiFingerTapFlags because it was missing. It works on my Alienware 17 running Windows 10. Only difference was I had to hack the TouchPadPS2TM2417 and the TouchPadSMB2cTM2417 files. Aside from that, Perfect! I'd like to make a 2 finger double tap replicate Shift+Ctrl+Q. Is this possible? Worked, thanks for sharing brother. how do i make 2 finger tap be center button mouse click? Had no problems doing this on a Lenovo ideapad 110, running Windows 10 64-bit. Thank you! How can I get to know what different entries and different values represent? I couldn't find any official Synaptics document regarding this.